The Best 50 Years: Homemade Fudge, Anyone? 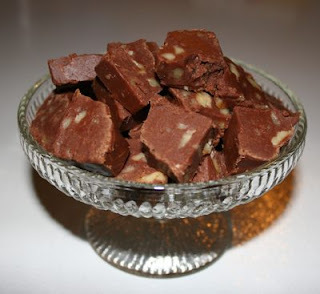 ﻿I've been making homemade fudge every Christmas since 1974. I know some may think it's cheating but I like the kind made with chocolate chips and marshmallow cream. Why? Because it's easy and I usually have all the ingredients on hand. Not that marshmallow cream is a common kitchen staple but I buy enough when it's on sale each year to get me through. Combine the sugar, butter and milk in a sauce pan. Bring to a boil over medium heat and boil 5 minutes, stirring constantly. Stir in marshmallow cream and vanilla, then beat with an electric mixer for a few minutes. Stir in chopped walnuts and pour into a lightly greased pan. Let set until firm, then cut and enjoy! That's it! And you'll have about 3 pounds of delicious homemade fudge for gifts or to enjoy at home. Merry Christmas! Crystal, that fudge looks sooo delicious. I do not have the knack for baking desserts, but my daughter does and she loves to bake fudge. I will pass your recipe to her and have her bake us some. Um, um good! And if you like mint, Loretta, have her substitute mint chips for about 1/2 of the chocolate chips. My favorites are Andes Creme De Menthe baking chips rather than the green chips that are shaped like chocolate chips. Enjoy your fudge!